Nowadays news sources outrageously title their articles. Can you guess which title originates from a fake news site? At first, we wanted to create a game, but the idea we first came up with was possibly controversial. So, we eventually came up with a different take on the same idea. We wanted to take a sarcastic and comedic undertone to our game. Hence, incorporating ‘The Onion’ came to be and here we are. 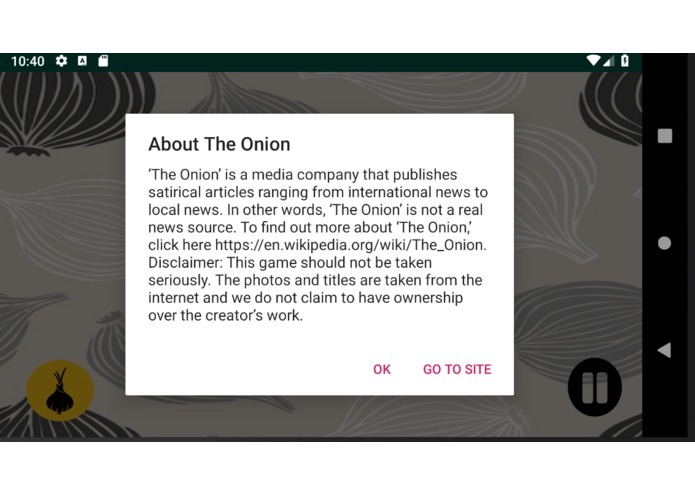 This mobile application is a game that consists of choosing between two news article titles pulled from the internet. 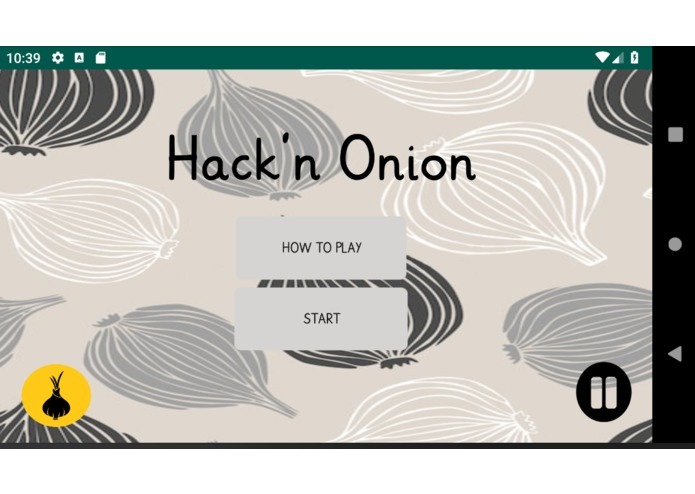 The player has to correctly guess the title that originates from the 'The Onion,' which publishes satirical news. You have to answer within 20 seconds or you automatically lose that round. If you guess the majority correctly, you win. If you don't, you lose. 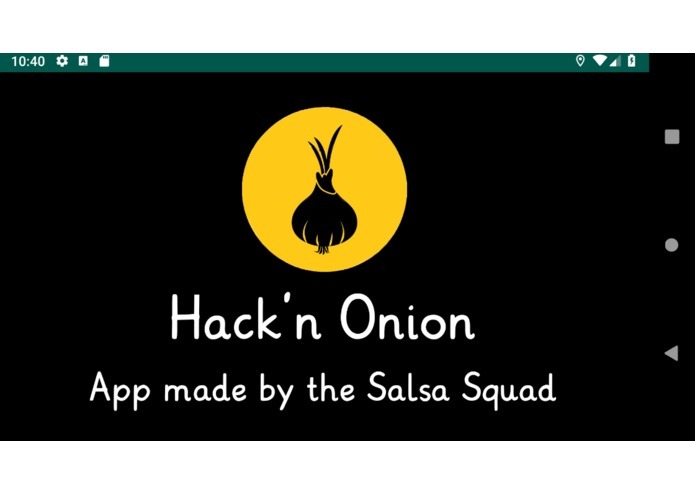 We built this mobile application using the IDE, Android Studio and an Android emulator. The programming language primarily used was Java, in addition to the assembly language XML. Besides trying to continue coding after 3 am, there were technical and graphical problems we faced during the 24-hour hackathon. Individually, we came into the hackathon without a team and without a direction in what to create. We were not comfortable working on Android Studio and struggled through it. Along with that, trying to create an application that is visually appealing to the user is a task all of us were not used to. Given that were not familiar with Android Studio and managed to create an app that is visually appealing makes us proud. We paid attention to the smaller details such as background, logos, buttons, sound effects and music that made the front-end side of the application enticing. Not to mention, this was the first hackathon for all of us and we just met each other 24 hours ago. To think we could all collaborate to make such an app in such little time and on top of barely knowing each other is worth noting. Before starting this project we were not comfortable with Android Studio and had no direction in what we wanted to create. We learned not only how to collaborate efficiently as a team, but also how important the small details matter in making an application come together. For this application, we made a simpler version of what the game could have been. If we were not under time constraints we would optimize the algorithm, create levels of difficulty, formats exactly as intended on different platforms and create a database to pull the different article titles. Along with this, we could improve on the design and functionality of the game by adding other features to make the application even more exciting!